Any cool decals on your Mirage? Saw a few Mirages and am I the only one who has a few decals on the car? I generally try to keep my car rather non-descript. I don't like to call attention to myself. (thus the very quiet performance exhaust, and the really grippy tires that allow me to take curves at entertaining speeds in complete silence) But, I do have two things on the back of my car. First, I have an Underdog sticker covering the hole where the rear wiper was. Needed to cover it with something, so I thought I'd make it something fun. The Mirage is very much an "underdog" in the autocross competition that I do, so it fits. And, also autocross related, because I drive a Mirage that has no business being on an autocross course... much less actually finishing ahead of anyone else... my best time at any given autocross event has been dubbed "the line of shame". You'll hear people say "I don't care if I win my class or not, as long as I finish above the line of shame!" It's fun. So, I found an "LS" badge from a Mitsubishi Diamante, and stuck it on the back of the car. The LS stands for "Line of Shame". But, it blends in so well and looks like it belongs there, so nobody really noticed! I have a Dutch Brothers coffee sticker in Seahawks blue-and-green, an I (heart) Washington sticker, and an NRA decal. I have stickers in Kanji that say Mitsubishi Mirage and a Navi fairy from Zelda. Also a Pacific Northwest and THICC stickers my brother gave me. Will post pics soon.jpg. I have a few lightning bolt stickers. Each one adds 10 horsepower. I have a 4WDABC sticker, VanAqua sticker, and the JurassicPark logo. That's cool. 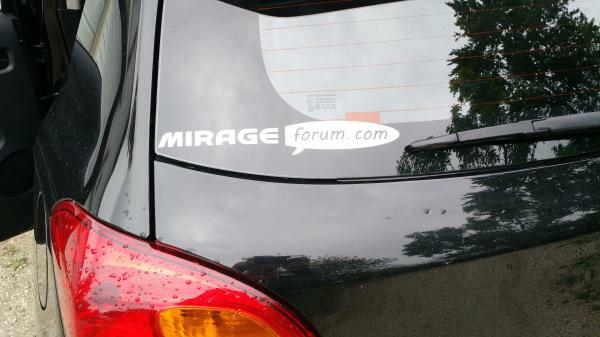 None of my business really, but I was curious.. where did you get your mirage forum and MIVEC stickers from? Looks sharp. Was it a DIY project?